Apartment, max 4 persons town of Crikvenica Conveniently situated in Crikvenica, this apartment is a very good point from which to visit this vibrant city. From here, guests can enjoy easy access to all that the lively city has to offer. Entertainment and Outdoor activities: tennis court, TV, Satellite television. Kitchen information: microwave, washing machine. Apartment near the beach, 46 square meters, great guest reviews town of Crikvenica Trendy apartment will provide all things you need for your fantastic holiday getaway. Visit the many historic and cultural sites and take memories from holidays as dazzling souvenirs. General details: air conditioner, barbecue, parking. Distance to the restaurant: 350 m. Distance to the beach: 300 m.
Apartment, 19 square meters, close to the beach town of Crikvenica Book comfy and inexpensive holiday apartment situated in a peaceful part of Crikvenica, only 150 m away from the nearest beach. Distance to the beach: 150 m. Distance to the restaurant: 110 m.
Holiday apartment, close to the beach town of Crikvenica This sizable apartment is situated in the residential area of Crikvenica and in its brightly colored rooms can provide you anything you need during the course of your stay in this attractive city. General details: barbecue, parking. Distance to the beach: 1 km. Distance to the restaurant: 1 km. Apartment, 100 square meters town of Crikvenica Apartment in Crikvenica, just few kilometers from Crikvenica which is well-known as the top destination in all Croatia. This apartment is comfortable, furnished in traditional Croatian style, has a great position, big terrace and all supplies that are necessary for your holiday. Parking place is also provided. Accommodation, max 10 persons town of Crikvenica Spacious summer villa overlooking the sea is an ideal accommodation for a holiday break in the prominent tourist spot - Crikvenica. In addition to the proximity of the attractive pebbly beach and the city center, this accommodation provides you with a completely equipped, air conditioned interior and a private parking in the yard. Distance to the restaurant: 6km. Distance to the beach: 7km. Distance to the bar: 500km. Entertainment and Outdoor activities: TV, Satellite television. Accommodation near the beach, max 7 persons, with garden town of Crikvenica Book accommodation outside the center of Crikvenica and enjoy the perfect family vacation in one of the most famous seaside resorts in Kvarner. In addition to the spacious courtyard with an eye-catching garden and a private parking, this villa provide you with comfortable interiors, fully equipped with modern conveniences. Entertainment and Outdoor activities: TV, Satellite television. Distance to the bar: 1km. Distance to the beach: 9km. Distance to the ferryboat: 25km. Distance to the train: 25km. Accommodation near the beach, 120 square meters, with pool town of Crikvenica Villa is located in the center of Crikvenica. Because of its location, this villa is really attractive. Sightseeing will be easily accessible and all attractions you can visit on foot. Distance to the golf club: 180km. Distance to the restaurant: 5km. Distance to the train: 25km. Distance to the beach: 5km. Entertainment and Outdoor activities: TV, Satellite television. Peaceful accommodation, 180 square meters town of Crikvenica Spacious summer villa overlooking the sea is a best accommodation for a family vacation in the prominent tourist spot - Crikvenica. Besides the proximity of the attractive pebbly beach and the city center, this accommodation provides you with a completely equipped, air conditioned interior and a private parking in the yard. Entertainment and Outdoor activities: TV, Satellite television. Distance to the bar: 2.5km. Distance to the beach: 7.5km. Peaceful accommodation, max 10 persons, with terrace town of Crikvenica If you've selected the Kvarner for your summer place, go to Crikvenica. Book your vacation in this comfy and perfectly furnished villa in a quiet area of Crikvenica merely 180km from the beach and the magnificent Adriatic Sea. Entertainment and Outdoor activities: TV, Satellite television. Distance to the train: 30km. Distance to the sea: 180km. Distance to the restaurant: 6km. Distance to the beach: 6km. Apartment near the beach, max 3 persons, internet connection town of Crikvenica price per day from € 21 Apartment near the beach, max 3 persons, internet connection. Distance to the shopping center: 20 m. Distance to the beach: 230 m. General details: heating, parking. Apartment, 26 eur per day town of Crikvenica price per day from € 26 Apartment, 26 eur per day. Distance to the marketplace: 500 m. Distance to the beach: 30 m. Distance to the restaurant: 20 m.
Hotel Esplanade town of Crikvenica Hotel Esplanade is located in the city Crikvenica, at the Adriatic Sea. It is located 20 metres from the beach and presents rooms with wooden floors and a private toilet. The air-cooled dining establishment serves local and international meals in the dining room or on the covered outdoors terrace. Visitors can enjoy aperitifs in the bar and live music on the terrace, which is frequently played during summer months. Guests can advantage from a 24-hour front desk and free onsite private car parking upon request. The hotel has direct access to a beach, which has an entrance fee. The centre of the town is 800 metres away. Hotel Kastel town of Crikvenica This one-time abbey is positioned along a pebble beach in Crikvenica and presents a veranda outdoors terrace looking out over the Adriatic Sea. The sizable rooms at Kastel come with a satellite television, seating area and wooden floors. Each has a private toilet with a bathtub. The dining establishment is situated on the first floor and serves morning meal and dinner. There is also a à la carte restaurant serving local and international meals. The centre of Crikvenica with its vibrant eateries and clubs is 50 metres away. Rijeka International Flight terminal and Rijeka’s train terminal are less than 35 km from Kastel Hotel. Hotel Vila Ruzica town of Crikvenica price per day from € 63 Set in backyards, Hotel Vila Ruzica is 50 metres from the beach and 300 metres from Crikvenica’s centre. Free internet access can be accessed in public areas. The rooms at the well-designed Hotel Vila Ruzica are embellished in warm colours. They have carpeted flooring and include a minibar and a private toilet with a hairdryer. Visitors of the Vila Ruzica can enjoy a rich buffet morning meal prepared with seasonal ingredients. The à la carte dining establishment serves domestic meals for lunch and dinner. Room service is also available. For younger guests, it presents a children’s playground. Crikvenica-Apartments.co.uk brings you online bookings at the best selection of hotels and apartments in Crikvenica. If you love the clean sea, peaceful beaches, domestic foods, then you have to come, see and experience Crikvenica. We are continually researching options for accommodation in Crikvenica so that we can offer you the best value hotels, villas and apartments. Riviera of Crikvenica goes from Jadranovo in the north all the way down to Selce in the south, and offers all kinds of vacations and recreation. Numerous sports courts and facilities are available: soccer, water-polo, paddling, surfing, sailing, tennis, mini-golf. Hotels, camps, apartments, rooms, villas, a coast with long beaches, bathing spots and festivities, are all in accordance with the hundred-year-old tradition of tourism in this town. The hinterland of Crikvenica offers a whole array of possibilities for hiking and hunting, so the season goes on all year long. Clean sea and abundance of sun, 8 km of sandy beaches framed by the lush Mediterranean vegetation, make Crikvenica hotels and villas the ideal place for your pleasant and fun vacation. Along with gorgeous natural environments, transparent seas and unpolluted air, and traditionally friendly residents, one of the essential reasons for picking Crikvenica for your vacations is the region's pleasant, consistent and healthy Mediterranean atmospheric conditions. The winter months here are gentle, the summer months are pleasant yet not too warm, perfect conditions for the progression of health tourism here over century ago. Nowadays, along with Selce, Crikvenica is among the most interesting sections of the Kvarner riviera, and also of the Adriatic shoreline of Croatia in general. This compact Croatian town close to Opatija, along with Dramalj, Selce and Jadranovo forms the widely known and beautiful Crikvenica Riviera, that provides lots of exciting tourist facilities. All those who enjoy dynamic holiday breaks and all those who would like a calmed and peaceful vacation are welcome right here. Because of its vicinity to Zagreb it is a preferred holiday weekend resort for numerous of Zagreb's citizens, and the stretches of sandy and rocky beaches that are joined together by an attractive promenade make it really appealing for both worldwide and domestic guests. Rijeka Airport is the closest airport to Crikvenica, situated close to the village of Omisalj on the island of Krk, roughly 20 km from the center of Rijeka. From Rijeka Flight Terminal, you can transfer to the main bus station in Rijeka with one of the transfer buses that wait outside the terminal building. From main bus station in Rijeka, get another bus to Crikvenica – the trip time is approximately 40 minutes. There are some buses to Crikvenica from other parts of Croatia; alternatively, take a bus or train to Rijeka and then make your onward trip from there. The interior of St. Ferdinand. The memorial studio of Zvonko Car. The museum of the city Crikvenica. The bronze statue of a fisherman, a work by the sculptor Zvonko Car. The Aquarium, located in the centre of Crikvenica with more than hundred fish species from the Adriatic Sea. The Church of the Assumption built in 1412. Omorika Beach, pebbly beach with some paved parts. City Beach Crikvenica, most famous beach in Crikvenica awarded with a Blue flag. There is a good choice of accommodation to suit almost all tastes close to the Crikvenica City beach. Kacjak Beach, a great choice for families with small kids. 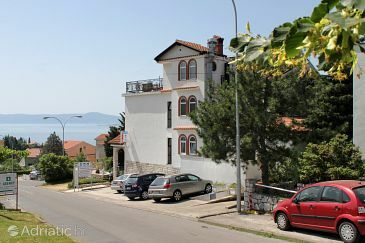 On this page, Crikvenica-Apartments.co.uk has carefully selected a choice of hotels and apartments near Kacjak beach. Balustrada Beach, sandy beach with lots of facilities, beach equipment and a variety of water sports. Crikvenica is protected from sturdy winds by the hills of the Kapela mountain range to the north and by the island of Krk from the seaside. This great location gives the local climate a mix of Mediterranean and continental attributes. Dominant, nonetheless, are the moderate, consistent Mediterranean meteorologic conditions, characterised by lots of hours of sunshine and the existence of streams of both mountain and sea air. The intermediate temperature level in winter season is around 8 ° C, and in summer months approximately 25 ° C. Snowfall, fogginess and temperature levels below 5 ° C are quite unusual. Intermediate sea temperature levels in summer season range from 23 ° C in June to 26 ° C in August. Use our accommodation list to make reservations online. For detailed Crikvenica hotel information or to reserve a hotel in Crikvenica, please select resort and let Crikvenica-Apartments.co.uk be your Crikvenica travel agent.